Inspired by Linda’s post about thigmomorphogenesis, I decided today I would add the word gravitropism to your vocabulary. It simply means growth in response to gravity. Shoots of plants grow up, because they are negatively gravitropic, they grow against the pull of gravity, while roots are positively gravitropic and grow down towards the pull of gravity. And why is that so important? Well… this is what happens when gravitropism is missing. To the left is normal old corn. The plant to the right was not sat on by a raccoon or anything, it simply has a mutation in a gene called lazy plant1. I’m not kidding. That’s the official, scientific name for this gene. Geneticists have fun with their names, though fruit fly geneticists are for sure the kings of silly gene names. This gene got that name because, as you can see, without a functioning copy of that gene, the corn plant no longer can detect the pull of gravity and so flops down in a “lazy” manner. 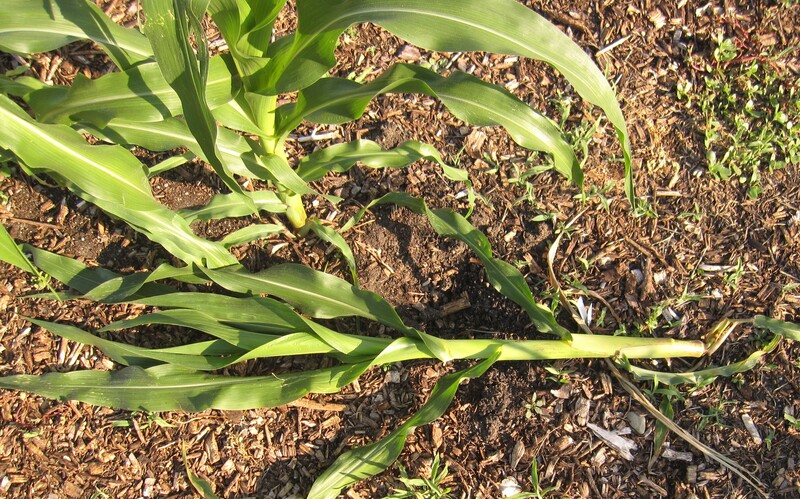 This corn is just odd, of course, with no real value (though it was fun to grow) but similar mutations are what give us some of the “weeping” or trailing forms of popular ornamental trees and shrubs.